-Thaw the puff pastry sheets as per packet instructions. -Remove each sheet and as you know it has 3 long layers.Cut each layer in the same folds,you will get 6 long stripes with one packet. -Take each stripe and make a diagonal cut along lengthwise to get two traingles.Similarly repeat for all stripes. You get a total of 12 triangles. -Preheat oven to 400 degrees F and line a tray with parchment paper. -Place a piece of chocolate in the base of triangle leaving an inch from the side. -And start rolling till you finish the stripe.Finish it off by applying a little water to seal .Fold in a shape of crescent and place it in the tray. -Apply egg white with brush liberally and repaet the step for other triangles. -Remove from oven and cool for 5 mins and enjoy with tea!! This is fantastic Julie!! 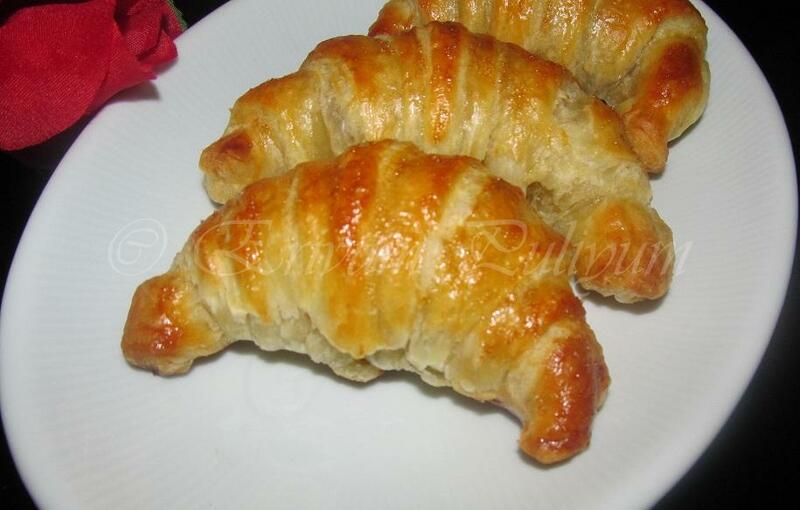 Making croissants from scratch is soooo time consuming, that I was discouraged to try again. wow...It has come our perfectly Julie! Looks really yummy too!!! 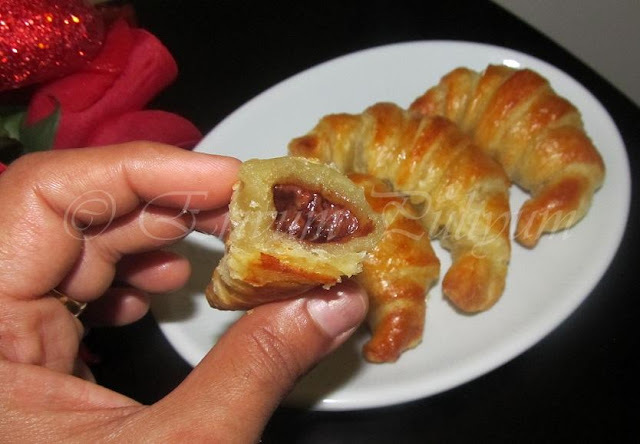 i usually had this chocolate stuffed pastry in Panera Breads...my kids love it a lot, haven't tried it at home...u have done it very well...croissants come out perfectly...love it!! Wow! Beautiful! Just want to pick one! Love chocolate stuffed croissants! Great idea to make them at home..looks great! Looks wonderful nice idea with puff pastry ! Looks awesome. I have never tried baking these before. Nice job. wow these are beautiful julie! Chocolate filling puff pasty looks crunchy and delicious. wow!looks so cute and perfect..loved this! Lovely croissants!! Loved the chocolate stuff..
wow.. lovely shape.. stuffing is good..
Looks delicious..kids will like it..
wow very different and interesting... makes me drool!!! 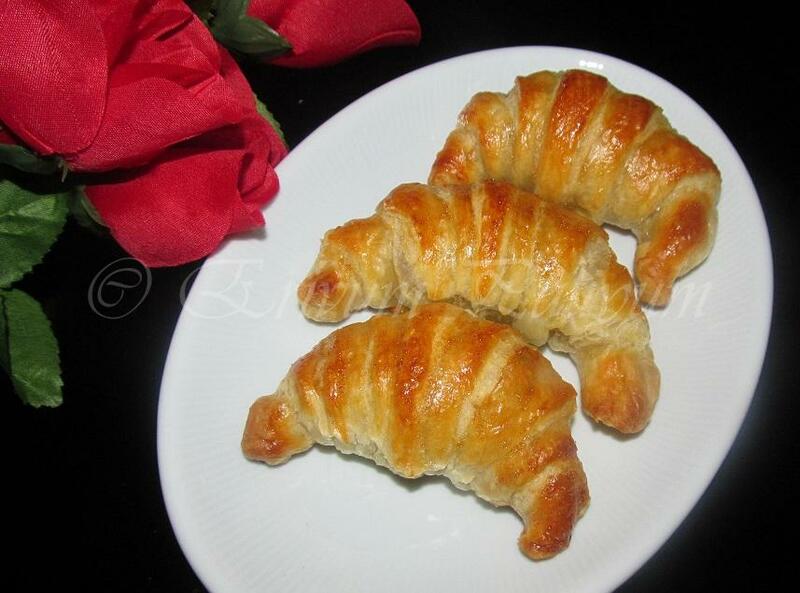 Mouthwatering here, wat a terrific and super tempting croissants. Wow...Quick and delicious...Loved the idea of using puff pastry and these cuties look perfect...Nice filling too.. Wondered why I never got any updates despite following you. but did it again. these look so delicious and crisp. Like the idea of puff pastry and chocolate. Looks good! Loved them..my Hubby Fav one..bookmarking..thanks for sharing ..
chocolate filled crossaints are my son's favorite..love the way yours look..perfectly baked, nice and golden..
Who can resist at a croissant filled with chocolate, surely not I! Totally delicious! That looks exactly like the ones we buy from the store. Well done Julie!